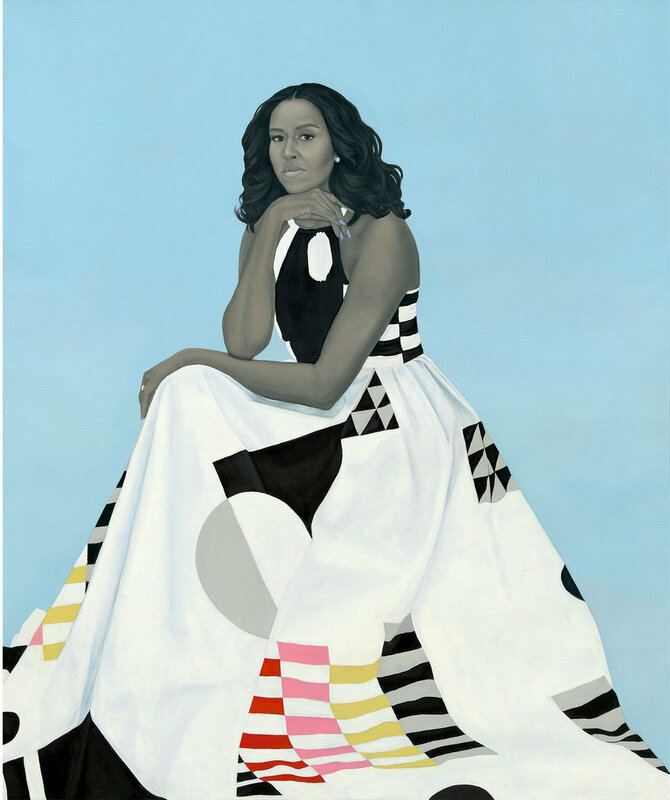 I am sure by now you've all seen the unveiling of the Barak & Michelle Obama's portraits that they commissioned from world famous Kehinde Wiley & Amy Sherald. As I watched the interviews of the artists yesterday I had a flash back to a conversation I had with a painting professor my university days. His name slips my mind but I never forgot what he said. He told me that Fine Art was the "last frontier" for black people in North America. Now being from Jamaica where I was never a visible minority (race or gender) many of the isms that minorities who where born in North America face had never been an issue for me. It wasn't until I moved to Canada for my post secondary education that I encounter some of those isms. Ok I digress...... back to that professors conversation. He began to explain the many issues and isms that I would face with as a black woman in Fine Art & Design living in North America. He talked about how people of African decent was not seen in the same intellectual light as other fine artists. He also listed many of the well known African American artist where just well known as "African American" artist. I remember leaving his class room feeling really depressed and disappointed it also made me realize why I was the only black person in 97% of my art classes. I was also really grateful and happy that I was from Jamaica where I didn't feel bogged down with other peoples baggage. With that being said I've always been a hopeful optimist in a realistic sort of way. So am much as he gave me a dose of his reality I always hoped that things would be different when I was done doing my thing and it was for me. The thing is, I moved back to Jamaica after school and at that time that was my saving grace. Fast forward to me being back in North America, I noticed some of those issues that professor had told me about still being played out today. Although there has been some change that change has been slow until now. Today, the day after the unveiling there is a new twist on an old conversation I am once again hopeful & proud. The works of Kehinde Wiley & Amy Sherald speaks volumes in more ways than one! Just look at the past portraits the style in which they were painted the emotion they once wanted to evoke. What the Obamas did is a refreshing change especially now that we are living in what I call the " Us & Them" period in time. For me this unveiling is especially important to all the hopeful budding artist out there that there is a place for them. Now all I can hope is that some of that positive ebb and flow moves north. This morning I was listening to CBC and they were talking about the Picasso painting titled Les Femmes d'Algers is currently up for auction in NYC and it's valued at $140 million. At one point in my life that would have inspired me beyond words but now not so much. Now all think about is who's actually making any money off of that artwork? Don't get me wrong, I'm not hating on art lovers and patrons because that would just be silly. However you have investors & you have patrons and when I say investors I mean people who purchase art as an investment not because they love your work. I have seen first hand how some investors celebrate when a visual artist dies because suddenly the value of the artwork they purchased awhile back just went up significantly, how sad is that? Wouldn't it be great to see is living artist making a real living off of their work? We should support the living and respect the dead. What I love about this time that we are living in is all the different ways artist can make a living off of their work, thanks to the internet. First I think many artist have to change their mindset about what it truly means to be a successful artist. My philosophy is that every one deserves to be happy doing what they are meant to do. Who likes working with someone who's miserable at their job? So anything I can do help another creative do well I most definitely will. After my last post I got a few emails asking about some of the tools or literature I recommend. So I have links to a few books and online platforms for you to go through. Books: Artist and graphic designers market - this book is great source of information,. It has a list of art buyers and how they prefer to get your portfolio. Graphic Designers Guild handbook of pricing if you can only afford one book then this is the book you should get. It helps to guide you with pricing . If you art not a designer, you should seriously consider hiring a professional to help with your branding. Remember a well designed site goes a long way. The only difference between an commercial illustrator and a traditional artist is all in your mind. There is nothings wrong with thinking of a buyer when you are creating a piece of art. You don't have to wait for that annual art fair or your curator to sell your work, you can do it on your own too. Today I was a bit taken aback by the news that after less than 5 years in Target is closing all their Canadian stores & filing for bankruptcy,to be honest I wasn't surprised. The thing that really shocks me about large companies that seems to be "with it" like Target, is that it really didn't do their homework. I like many Canadian would always have to make a trip to Target whenever we would cross the border and it always seems like this wonderful event. After many years of hoping that Target would finally make their way up to Canada, I was so disappointed when they opened their doors. Here are some of the key mistakes that I think Target made. They bought Zellers! There's a reason why Zellers died a slow and painful death for me that store was the manifestation of depression! When ever I walked into a Zellers it because I was out of options & needed something really badly. I would spend as little time in Zellers as possible & since they closed down I clearly wasn't the only one. So when Target bought Zellers I assumed that they would do as much as they possibly could to differentiate their brand from Zellers but they didn't. They kept the same location, store layout and horrible lighting! I remember walking into Target Canada for the first time and getting the exact feeling I got when I walked in Zellers Welcome to Depression ville! I honestly think they even kept the same staff! I don't know about you but it use to be a 30 min's wait in line to ring your items in when you only had two people ahead of you. As much as am sorry to hear that 17 thousand people are going to be loosing their jobs I'm sure they knew it was coming. It's always so sad when the people who don't have the power to make decisions suffer because the head of the company made all the mistakes & gets to keep their large severance pay. They should not have bought Zellers! They should have made their stores a destination zone, look at how many people showed up at the new Tanger shopping mall, even thought it's in the middle of nowhere? Instead of trying to cover they entire city just focus on a few key locations and do them really well. Don't sell the same stuff that they have in Walmart and Zellers. Target in known for nice fashionable goods at a reasonable price and thats why many Canadian travel hours to shop at Target across the border. For some reason when international stores come to Canada the products aren't as good. Sell the same stuff that you sell in the states & for goodness sake have an online store.